Logan, Utah – Tucked away, almost unnoticeable on Logan’s Center Street in a nondescript building without flashing neon or bling in the windows is one of Utah’s most unique bike shops. You won’t find a $10,000 triathlon bike or a Pro Tour worthy speedster at Robert Hamlin Bicycles. But if you’re looking for a custom build that will have you cruising over gravel roads on bike expeditions, this might be your go-to bike shop. Who is Robert Hamlin and why does he operate a bike shop without any posted hours of operation? Well, the answer is about as unique and interesting as Hamlin’s trademark mustache handlebars that are easily spotted at the Utah Cyclocross Series races. Here’s a quick Question and Answer look at Robert Hamlin Bicycles. What inspired you to open up such a unique bike shop? My favorite bicycle shop in college was Recycled Bicycles in Gainesville, Florida. That was the inspiration and the name of my first shop here in Logan. I started in 2005 by buying used bicycles from the DI, making them ridable in my garage, and selling them in the front yard. I moved to a store-front location on West Center Street for a few years, then to my current location at 170 East Center Street. 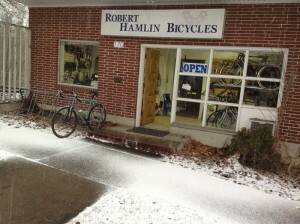 I have changed the name of the shop a few times, but I will always just be Robert Hamlin Bicycles in the future. My goal is to keep it simple. I want to help people obtain simple, inexpensive, utilitarian bicycles that are comfortable and efficient to ride. That balance is not easy to achieve. Robert Hamlin Bicycles aims to keep it simple and to put people on bikes. Photo: Courtesy Robert Hamlin. Your shop appears to be a labor of love in many regards, how did your love for handcrafted bikes come to life? Where has it taken you? I have been in love with bicycles my entire life! 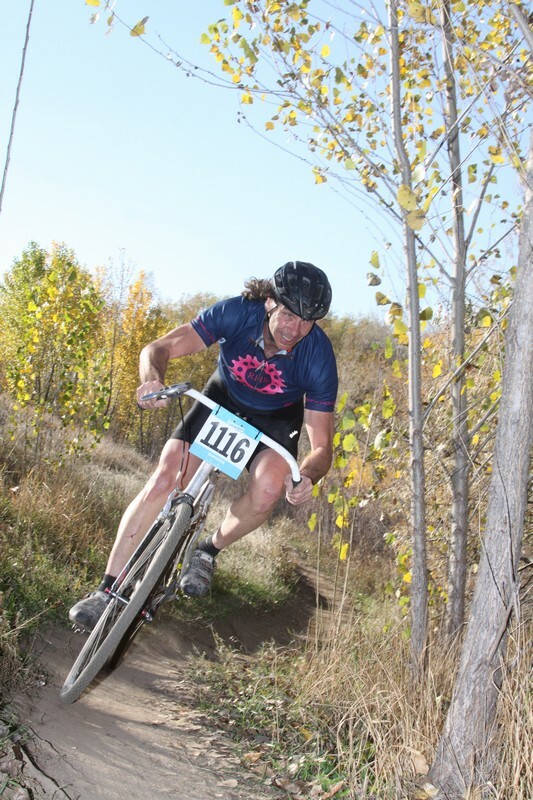 BMX in the early 70s, a Raleigh Rapide 10-speed in 6th grade, road racing in college, mountain bike racing in the 90s, and now Cyclocross is my passion. I helped sell bicycles in several shops during college. I worked for Carl Strong in Bozeman, Montana. Carl is absolutely the best handcrafted frame builder out there. Helping to build steel bicycle frames has shaped my current beliefs and business model. I do not build bicycle frames, but I try to get customers the next best thing. The first step is to ask the customer how they want to ride a bicycle, or better yet, how they envision themselves riding a bicycle five years in the future. With a vision in mind, I begin with a quality, yet inexpensive, production steel frame from Soma or Pake (both are from Merry Sales in San Francisco, California). I professionally prep the frame by reaming and/or facing the head tube, bottom bracket shell, and seat tube. Then we select wheels, saddle, bars, and gears (or no gears). The customer gets to choose based on their needs. Again, the goal is to balance comfort and efficiency. If they want to sit more upright with sweptback touring bars, fenders, and only five speeds, that's what they get. If they want a modern fast Soma Smoothie 11-speed road bike, they can have that too. You're clearly not a big-box type of bike shop and I'm guessing that's by design. What are your goals for your business? I often say to customers, “You would never buy a pair of pants with shoes already attached.” That's what you get with an off-the-shelf bicycle. That said, I do sell off-the-shelf cyclocross bikes, hard tail 29ers, and singlespeed 29ers from Redline. They are great bicycles, but there are only a few of these bicycles on the floor. Most are closeout purchases so I can sell them at in-season wholesale prices. There are no major brands like Trek, Specialized, or Giant. So yes, I am a small one-man shop by design. I am passionate and opinionated. My goal is not to make it big and get rich. It's to help customers get a steel frame bicycle that suits their needs. My favorite is one that can be used for cyclocross, road, touring, or commuting. I know that one bike can not do everything really well. There are many folks out there who want a carbon road bike, a carbon mountain bike, and a carbon ‘cross bike. But most people, even if you race, do not need carbon. For me, my $259 Pake C'Mute frame set up as a singlespeed does it all. What do you do when you're not tinkering with single speed bikes and racing cyclocross? I am a wildlife ecologist. My spouse is the national expert on wildlife crossing structures and road ecology. We met in graduate school, and I work for her. I spend quite a bit of time in Montana monitoring crossing structures, taking pictures of white-tailed deer and other species with trail cameras as they move under US 93 in the Bitterroot Valley. I analyze pictures and write reports for the Montana Department of Transportation. The shop is open part-time and the hours are not posted on the door, so call me if you need me. You're pretty noticeable on the CX course and it's not just your hair. What's the story behind your mustache-handlebar bikes? Oh, thank you for the compliment. It's a long story. The flared drop bar has been around a long time. If you look at pictures from 80 years ago, that is what you see. Long days in the saddle and rough gravel roads were defeated with flared drop bars set way up high. For me, it has to do with broken shift/brake levers, too many gears that make shifting complex, drops that are so deep they are never used, and not feeling secure on the hoods during a cyclocross race. Mostly, all my flared drop bar heroes of the bicycle industry are responsible: Charlie Cunningham (WTB Dirtdrop inventor), Brant and Shiggy of On-One (Midge Bar inventors), and Matt Chester. Matt Chester has a wonderful article on the subject written in 2005 at www.63xc.com/mattc/midge.htm. The On-One Midge bar has so many wonderful advantages when riding a cyclocross bike singlespeed or fixed gear, huge leverage, incredible control, and your hands in the drops, close to where they would be on the hoods in a normal set-up. The set-up requires some first hand knowledge, a long steerer tube, a longer reach, and a longer high-rise stem. Call me if you want help. We'll talk. What would be your dream bike to build up for yourself, assuming there's always another dream bike to create after you've built up the latest fantasy bike? It would be steel. Soma now has a new brazed frame called the Triple Cross made from KVA stainless steel tubesets. It's a heck of lot more than $259. But these days people spend $3000 just on tubular carbon wheelsets. So, why not? Fantasy bike, right? What's your fantasy bike ride/race? Why? For several years now I have talked about Idaho to Arizona, a dirt-road and singletrack bikepacking route across the mountains of Utah. It includes all of Skyline Drive from US-6 to I-70, and a big day across the Grand Staircase from Escalante to Big Water. This June, I may really do it. If that goes well, I may do the Tour Divide in 2015. I will turn 50 that year, so it may be a month-long celebration from Canada to Mexico.